This refreshing dish takes the best of what summer has to offer and puts them together in a unique combination. 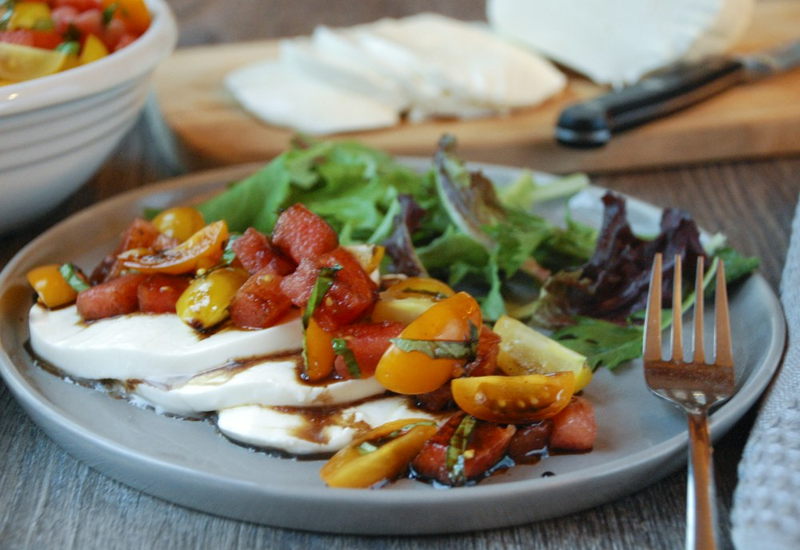 Fresh summer tomatoes, watermelon, and basil are combined and then used to top fresh mozzarella and mixed greens. A drizzle of balsamic reduction ties it all together. Feta cheese or goat cheese are also great substitutions for the mozzarella cheese. Per Serving: 502 calories; 26g fat; 39.4g carbohydrates; 28g protein; 90mg cholesterol; 1019mg sodium. So many flavors in this dish, very delicious! The balsamic reduction was absolutely my favorite part. Even though this is considered a summer salad, I enjoy it when the weather cools down too. Watermelon and greens may seem like an unlikely pair, but it actually tastes really good together. The balsamic reduction was really easy to prepare, and was a little sweet thanks to the honey. Overall I really enjoyed this salad. Perfect recipe for hosting! I skipped the greens and just served the watermelon, tomato, and mozzarella cheese with flatbread on the side. Made this dish for a beach picnic I took my wife on. It was really fresh and delicious. I also paired it with boneless, skinless grilled chicken breast to tie it all together. Very good..
Left out watermelon and served tomato and mozzarella cheese on a bed of arugula. The balsamic reduction is my favorite. Especially with the honey. Great for entertaining in the summer.